Wrentham Town Hall is located at 79 South Street, Wrentham, MA 02093; phone: 508-384-5400. Photo: Plimpton-Winter House, ca. 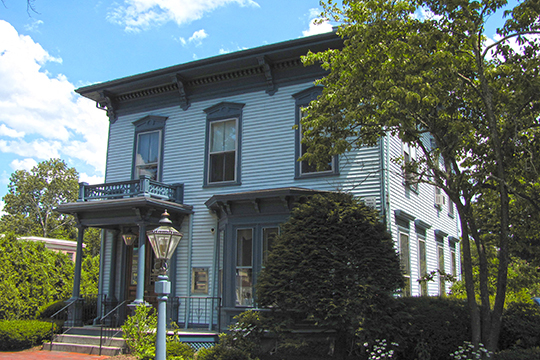 1868, 127 South Street, Wrentham, MA. Listed on the National Register of Historic Places in 1985. Photographed by user:John Phelan (own work), 2010 [cc-by-3.0 (creativecommons.org/licenses/by/3.0)], via Wikimedia Commons, accessed October, 2015. Wrentham was settled in 1669 and incorporated in 1773. It was originally part of Dedham and was named for Wrentham, England. During King Philip's War, just before the burning of the town by the Indians, the entire population fled to Dedham. At the beginning of the 19th century, the town underwent industrial development with the establishment of several woolen and cotton mills. The manufacture of straw hats, started in 1798 by Mrs. Naomi Whipple, and the making of jewelry were expanded, several factories being opened. A tap and die company has a national market today. The development of the town as a summer resort has materially aided its present prosperity. At the village center stands a granite stone marking the site of the First Meeting House (1684).